The L.A. area is not just for Disneyland. Make time to play on some of the beautiful California beaches and enjoy the Pacific breezes. The beaches in Los Angeles and surrounding areas vary widely in their offerings for visitors. Here are the six best kid friendly beaches in Los Angeles. Now, slather the kids with sunscreen and hit the beach!! Includes the beaches on either side of the Santa Monica Pier. Paved paths, cafes, well-maintained restrooms, and proximity to the attractions of Santa Monica Pier make this one of the best beaches for families. Keep going south and you’ll experience the weird and wonderful people watching of Venice Beach. Santa Monica Pier is also the end of the line for Historic Route 66. The surfing here is good for beginners. County Park. Located off Pacific Coast Hwy (Calif. 1) a mile past Kanan Dume Rd in Malibu. 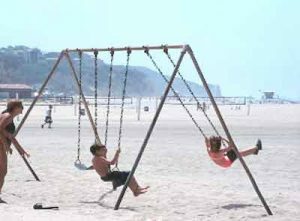 LA County’s largest beach park has loads of kid friendly beach facilities: plenty of restrooms (not clean, but available), lifeguards, playgrounds, volleyball courts, and snack bars. The parking lot runs the whole length of the beach so is near the sand (handy if you carry lots of kid stuff). Whales come through in March and April, amazing to see! This family friendly beach is good for boogie-boarding or body surfing, rather than surfing. The water is warmest in August and September; otherwise it’s pretty cold. 23050 Pacific Coast Hwy in Malibu. Great for teens who are expert surfers; surfing is not as territorial here as in other areas. Facilities include: lifeguards, surfing (expert), swimming, fishing, volleyball courts, restroom, showers. 17700 Pacific Coast Hwy, (between Sunset Blvd and the Santa Monica border) Pacific Palisades. Pay parking lot extends the length of this family friendly beach which means the car is not too far from the sand. Restrooms, showers, bicycles, fishing, volleyball courts, lifeguards and snack hut are available in season. The waves are friendly for swimmers and for beginning surfers. Hermosa Ave & 33rd St. in Hermosa Beach. Plenty of street parking, restrooms, lifeguards, volleyball courts, playgrounds, a fishing pier, and good surfing for intermediate surfers make this a best family beach. Extending the length of the beach is the The Strand, a wide smooth pedestrian lane. Pier Avenue, the main entrance, is lined with shops and cafes with outdoor seating. South Esplanade Dr. via Pacific Coast Hwy (Calif. 1) or Torrance Blvd. Facilities including: restrooms, lifeguards, playground, fishing, pier, bicycling/bike path, diving, boating, showers, volleyball courts, and good surfing for intermediate surfers make this one of the best beaches for families. Connects to Hermosa Beach and The Strand pedestrian walkway with shops and eateries. Find great rates on kid friendly hotels in Los Angeles using our secure reservation site.